First time, full time RVers. We are a family of three who have decided to try and live life through experience and exploration now, rather than later. 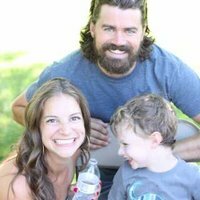 We have a 3 year old son and will also be traveling with our mother. We are so excited to start this journey, meet new people, eat great foods and enjoy all the beauty this world has to offer. We are looking forward to meeting other travelers and sharing stories about our travels. As for our professions, my husband has a lengthy background in IT and I am an Elementary Teacher who taught Reading Intervention. We both love what we do but feel very excited to take this break and head out to start this adventure! 2014 Chaparral Lite 29 BHS (Fifth Wheel) 3 slide outs. 35.5' long. 11.7' tall. No decorations. Akingston and family were able to contact us on short notice and we are so glad we did not miss their visit! We enjoyed meeting them and showing a wonderful young lad where to find the baby bunnies, goldfish, salamanders, and tops to acorns left by the squirrels. All in all a wonderful family and we would welcome them anytime. We hope to see them again. These guys were excellent guests, friendly, gracious and low maintenance! Young family traveling with grandparents, exploring our great country. You'll enjoy them if they land in your area.